On Thursday, November 16, despite blinding periods of heavy rain, seven hearty Pi members came to see and learn how backing up data could be done. Nancy Little demonstrated how she uses her .Mac account and Apple’s Backup (a free backup utility included with .Mac membership) to save and protect the data on her Mac. Among those interested were users who had .Mac accounts and had yet to use the Apple Backup program or any other function of that service. 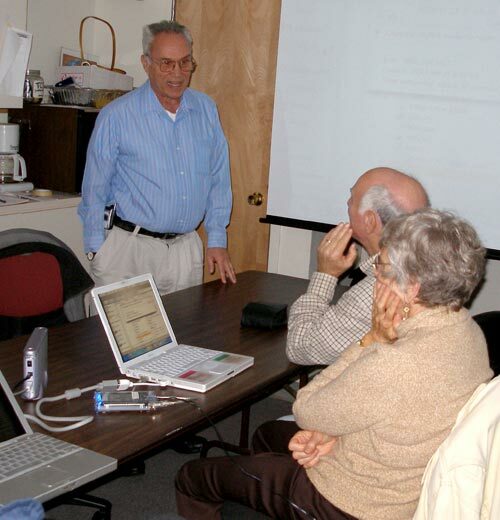 Len Adler, the SIG leader, also discussed a simpler way of backing up using an external hard drive. Len showed everyone how to simply drag and drop from the Mac to the external drive’s icon, which appears on the desktop. The disadvantage of doing it this way, of course, is that this is a manual process and only occurs when you remember to do it. Paul Silverman and Len Adler help Kee Kee Minor backup her photos. Photo by Nancy Little, taken with an Olumpus SP350 digital camera. Using Apple’s Backup, and other backup programs like Super Duper, Retrospect, and Carbon Copy Cloner, allows the user to set a daily time for backup; then, if the external drive is on and connected, the program will do the backing up automatically. Other backup options include burning to a CD-ROM or DVD, and if you have a .Mac account, you can even back up to your iDisk storage space on that account. That means that, while you are away from your computer, such as when you are sound asleep in the middle of the night, your Mac can be wide awake and working away backing up the files you designated. 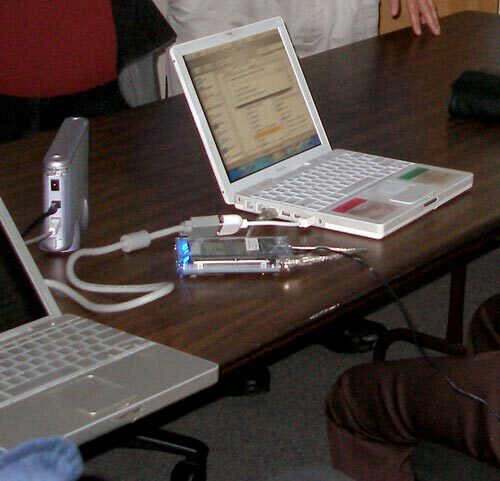 Inexpensive external drives, such as these used at the Retired SIG meeting, can be used to backup desktop computers as well as laptops. Paul Silverman asked about storing big photo and music files from the Mac’s internal hard drive -- how can that be done and how can it save space for new stuff? Unfortunately, no one in our limited group could answer those questions. We will try to provide Paul with an answer before the next meeting. We still have questions about the use of other tools to store data externally. Also, some of us burn data onto a CD or a DVD. It is always interesting to me to see the many ways there are to do a particular computer task. It makes the sharing worthwhile -- we learn so much about how we can approach a problem on the Mac. Our next meeting will be Thursday, January 25, at 1:00 p.m. Watch for the topic of the meeting to be announced on the Pi Web site.